ImmuneIQ is a pet immunity assessment that helps pet owners understand their pet's challenges (like allergies or reactions to toxins like cleaning supplies or gardening chemicals). Our kit is an at-home administered alternative to the traditional allergy tests given at the vet's office for around $200-$2000+. In fact, some veterinary dermatologists charge more than $5,000 for a series of tests over a year that involve painful skin prick or scraping using a scalpel like tool to literally remove a layer of skin and test it. Not with ImmuneIQ. We evaluate the saliva and a hair sample given to us by the owner. Our kit is pain free, affordable and doesn't require your vet to help you understand the results. Our approach to understanding and interpreting allergies and other immune issues is to look at the immune system's IQ. We believe in a broader and deeper level of understanding your pet's immune system than just eliminating something from their diet or their environment - which is nearly impossible. We have a very simple color coded results printout that we email right after our lab has processed the samples. Our process is completely unique and being evaluated for several patents both in the evaluation process and in our "lab to laymen" software we designed that generates the easy to understand report for every one of our clients - no background in medicine needed. And no need for to come back to your vet and pay another office visit fee, just to be read the results. Our customers love ImmuneIQ because it is pain-free and very affordable. We welcome the opportunity to hear from pet and lifestyle bloggers that feel this is a topic your readers would benefit from. If you have at least 2,000 unique visitors per month, we would like to hear from you. The test instructions were very easy to follow, and it was very easy and painless to get the samples from Venus to send in. I swabbed her mouth with a cotton swab and sealed it in a plastic baggie, then brushed her well and placed the removed hair into another plastic baggie. I mailed in my form with the samples to ImmuneIQ on August 25th and received a phone call that my results were ready to be emailed to me on September 2nd. The email contained a link to the allergy test results, and the results were very easy to read and understand. I am overall impressed with the results of the test itself, how easy it was to administer the test and later access the results of the test. I did feel like ImmuneIQ didn't organize their information well, but it may be because I was a reviewer and not a paying customer. The form I sent in had Venus' name, my name, and my email address. However I received a phone call when the results were ready (which were from my review account, not my order form) asking for my email address, and then received the results without Venus' name (which was the first item of information asked for on the form). 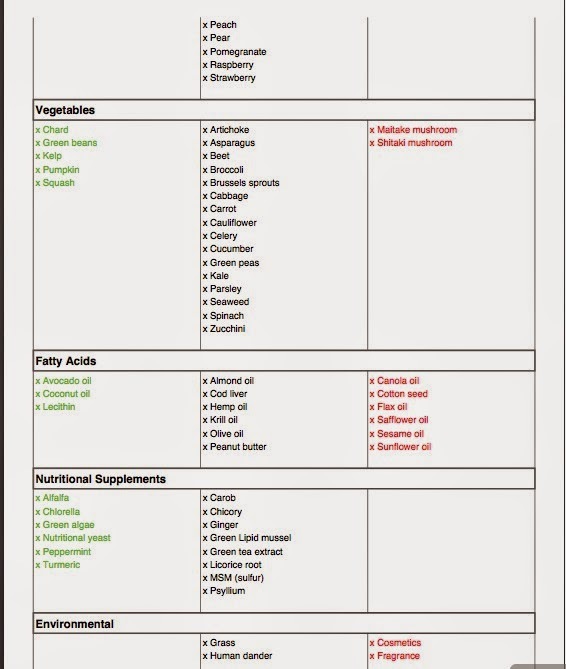 These details in no way effect how I feel about the test, and after struggling for years trying to pinpoint what makes Venus itch and turn red, we finally have answers that I can use to help me plan her meals and protect her from environmental hazards that may be making her especially uncomfortable. 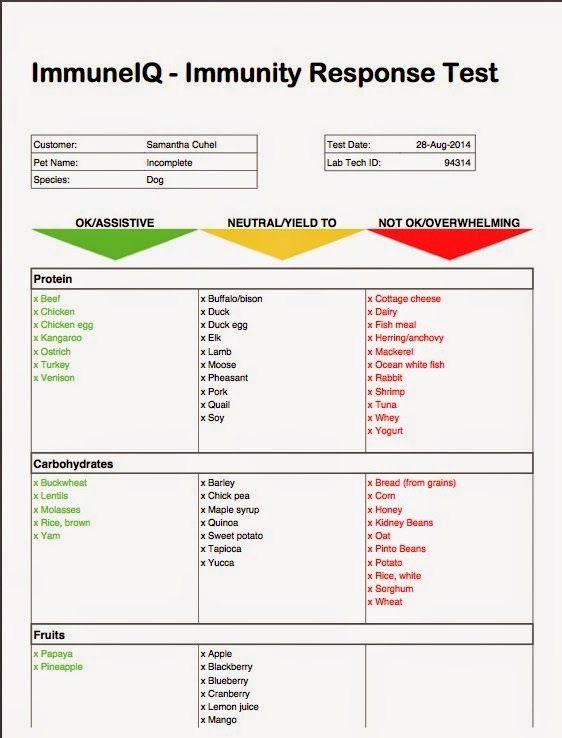 I highly recommend ImmuneIQ's pet allergy assessment to anyone with dogs or cats. You never know what may be secretly harming your pet, or maybe you know something is, but need an easy way to pinpoint what it is. Immune-IQ is for you.